Long-term liabilities/debt generally represent the most significant obligation for the corporation. Although this obligation does not impact a firm’s current liquidity, ultimately it becomes payable. Thus, there is significant concern with regard to the payment of ongoing interest and the ability to retire the obligation, either over time or when it becomes due as a single amount. Long-term liabilities are obligations arising from past events that are not payable in the coming year. Generally, there is a much greater degree of formality when an organization incurs long-term debt. Long-term capital leases, mortgage obligations, pensions, and other retirement benefit obligations are examples of long-term liabilities. Most of these elements, require the recognition of both a short- and a long-term obligation. All of these obligations must be managed properly to prevent a decline in the company’s credit rating. Companies that raise capital through the issuance of bonds would recognize a long-term obligation: “bonds payable“. Additionally, many companies provide to employees “pension” and “health-care benefits” upon retirement. Generally, these employee benefits are not earned until the employee has been with the company for a number of years, known as a vesting period. From an accounting perspective, companies that provide employee retirement benefits must accrue for them with the passage of time. If companies fund less than 100 percent of the accrued pension or other post employment expense, a liability for the future obligation must be recognized. Projected benefit obligation is the actuarial present value of employee benefits earned using projected salary levels and present years of service. Pension or OPEB plan assets are placed in trust by the company, invested, and then distributed to employees upon retirement. Their value fluctuates with the stock market and the economy. Prepaid (accrued) benefit cost is the pension or OPEB asset or liability being reported in the balance sheet. Net cost is the pension or OPEB expense for the current reporting year. “Service cost” increases pension expense because of an additional year of service benefits (pension and OPEB) earned by Abbott Laboratories employees. “Interest cost” is the cost of the projected benefit obligation, measured on a present value basis. The mere passage of time increases the projected benefit obligation and pension expense. “Expected return on plan assets” is used in the calculation of pension and OPEB expense to reduce its potential volatility. The reduction of pension and OPEB expense by an expected return on plan assets yields net pension or OPEB expense (or cost). “Net amortization relates to the actuarial adjustments (changes in discount rates, mortality rates, etc. )” that are made periodically, thereby increasing or decreasing the projected benefit obligation. Rather than adjust pension or OPEB expense dollar for dollar, the resulting gains and losses (known as liability gains/losses) are often amortized over time. A second adjustment often involves asset gains/losses. Asset gains/losses result from the difference between the expected return on pension or OPEB plan assets and the actual return on plan assets. Because of the potential for large swings in the stock market, the use of an average expected return over time reduces volatile reporting. Next, Abbott Laboratories reports an asset prepaid benefit cost of $43.5 million for its defined benefit pension plan and an accrued liability of $494.7 million for OPEB. This means that there are sufficient (actually an excess of) pension plan assets to cover Abbott Laboratories’ projected benefit obligation. However, the OPEB obligation is currently under-funded, thus the recognition of the $494.7 million obligation. Accrued pension and OPEB obligations emerge when the company’s pension or OPEB expense is not covered by an equal cash contribution to the respective plans. This recognition simply follows the accrual basis of accounting. Deferred income tax liabilities and assets represent future income tax obligations or future income tax benefits as a result of past events. They arise when GAAP and the Code conflict with regard to the timing of revenues, expenses, gains, and losses. The resulting timing differences are temporary (in most cases), but nonetheless create a reporting difference between taxable income and financial income. Timing differences result when revenues, gains, expenses, or losses affect financial reported income in one period but taxable income in another period. 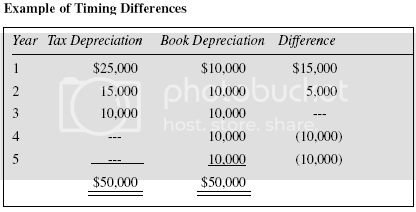 As noted, depreciation expense in year 1 is $25,000 for tax purposes and $10,000 for financial reporting purposes. The $15,000 difference is called “an originating temporary difference“. When we move to year 2, another $5,000 originating temporary difference results. The combination of the two differentials then becomes a “future reversing difference“. While no reversals occur in year 3, years 4 and 5 show a combined total of $20,000 reversing differences. What this means is that Royal Bali Cemerlang would report a deferred income tax liability in anticipation of greater taxable income down the road when compared to financial reported income. Keep in mind that while depreciation expense differences exist within periods, they are equal in amount over the life of the asset. In either reporting, $50,000 of depreciation expense is recognized. This is why these originating differences are noted as “temporary differences“. Therefore, in years 1 and 2, taxable income will be lower than financial reported income and reduce that year’s income tax obligation. In year 3 there will be no difference in reported income and in years 4 and 5 taxable income exceeds financial reported income. Nonetheless, because greater tax benefits were achieved in year 1, a deferred tax liability is reported in the balance sheet based on the difference in year 1. Ultimately, deferred tax liabilities become current tax liabilities. Depreciation timing differences are often the largest contributor to the magnitude of deferred tax liabilities. Because most companies take advantage of the accelerated depreciation schedules, deferred tax liabilities appear in the long-term liabilities section of corporate balance sheets. However, another expense related to health care benefits upon retirement give rise to a deferred income tax benefit (an asset). Companies that provide for employee healthcare coverage upon retirement must recognize an expense and a related liability (if not funded) with the passage of time. The tax authority does not allow the recognition of this expense until the distribution of benefits takes place. When companies accrue for this expense, they create future deductible amounts for tax purposes. Ultimately these expenses will lower taxable income and reduce future income tax obligation. Future deductible amounts are reported as “deferred tax assets“.